CEAR is the winner of the 2018 Bow and Arrow award winner for creative partnerships and demonstrating the inter-dependence among stakeholders. The CEAR team is pleased to continue our collaboration with local governments and work tirelessly to pave the way for more recycling opportunities. Our focus on reuse in the electronics recycling sector is helping to create a circular economy and to allow for more sustainability in the ‘e-waste’ industry. 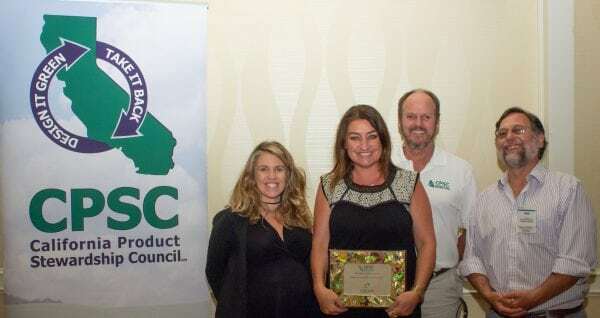 From left to right: Colleen Foster (City of Oceanside, CPSC Board Member), Kristin Dilallo (CEAR, Director of Marketing), Doug Kobold (CPSC Chair), Tedd Ward (Del Norte County, CPSC Board Member). —Photo by Matt Molinari.